Posted on Thu, Mar 29, 2012 : 3:09 p.m. Participants march with giant puppets along South Main Street in downtown Ann Arbor during last year's FestiFools parade. This year's event in on Sunday afternoon. The annual FoolMoon event on Friday kicks off a weekend of whimsical festivities culminating in the FestiFools parade on Sunday. On Friday, beginning at dusk, participants will walk with paper and wire lanterns on Washington Street, starting near Ashley, in downtown Ann Arbor. Organizers have announced the event will go on regardless of a somewhat rainy weather forecast. In conjunction with FoolMoon, Mark’s Carts will have a "Grand Re-opening Celebration" on Friday. 5 to 10 p.m. Five returning and three new food carts will kick off the new season with food and festivities. A music stage will be set on West Washington near the courtyard. No cover charge; price of purchases. The Courtyard is 211 W. Washington St., Ann Arbor. 734-213-7482. The "Annual Persian Cultural Show" will be held at the Power Center on Saturday. Doors open at 7 p.m. Featuring dance, music, poetry and comedic by the Persian Students Association. Dance performances will be by the Latino Students Organization and Iraqi Students Association with a special guest performance by K-Von the Comedian. $5-15. Tickets can be purchased online at www.tinyurl.com/psatickets or by caling 734- 763-TKTS. The Power Center is at 121 Fletcher St., Ann Arbor. 734-763-3333. Head to the "Mix Marketplace" for handmade and artisanal goods at Mix of Ypsilanti. Friday, 5 to 9 p.m. Saturday, noon to 5 p.m. There will be live music, a coffee bar hosted by Ugly Mug Coffee and a rotating collection of vendors selling a wide variety of foods, vintage and antique wares and handmade goods. Free admission. Mix is at 130 W. Michigan Ave., Ypsilanti. 734-961-8704. 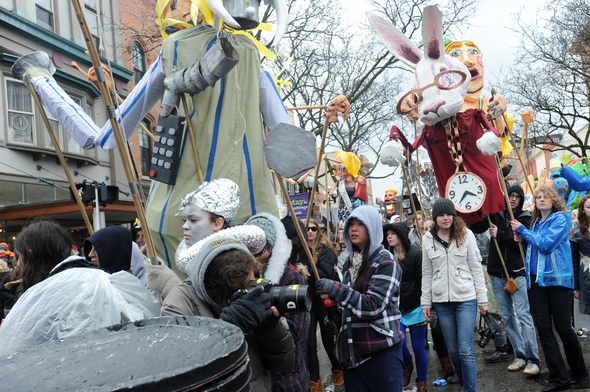 "FestiFools" returns to downtown Ann Arbor on Sunday. 4 to 5 p.m. Magnificent, huge, bizarre, politically incorrect, human-powered papier-mache puppets join thousands of Foolish friends frolicking about downtown. Free. South Main Street, between William and Washington streets. Sat, Mar 31, 2012 : 11:40 a.m.
Too bad the weather was so uncooperative last night; nonetheless, the luminaries (and their bearers, in many cases) were wonderfully amusing, and the spectators were clearly having a good time. Events like FoolMoon and FestiFools help make Ann Arbor a lively town. Whether a particular one appeals to a given Ann Arborite's tastes in entertainment (I 'd favor acoustic jazz &amp; swing with my luminaries over electrified pop and drumming such as what we heard last night, by way of example), it's all good. I think we should support as wide a range of public outdoor events as possible--assuming participants behave themselves reasonably well, of course. Sat, Mar 31, 2012 : 2:55 a.m. Sat, Mar 31, 2012 : 2:49 a.m. I gotta admit I was downtown during Foolmoon and how liberating and fun it was to see A2 let loose and get wild. What fun! There was even open street drinking and good times! Fri, Mar 30, 2012 : 10:34 a.m.
Fri, Mar 30, 2012 : 9:54 a.m.
Fri, Mar 30, 2012 : 5:20 a.m. There's a website for Festifools: http://festifools.org/ Seems like an obvious thing to have included in the article, but I don't see it there. Fri, Mar 30, 2012 : 3:05 a.m. Sounds like a great time, I'll be around, if I don't have to be a square. Work can be a bother some time. Fri, Mar 30, 2012 : 1:33 p.m. It is. We missed last year for one reason or another and this year way too much going on on Sunday. Otherwise? We would have been there. Enjoy the fun. Next year we will be there. Thu, Mar 29, 2012 : 8:06 p.m.
Fri, Mar 30, 2012 : 1:10 p.m.
Now get off my lawn you damn kids! Fri, Mar 30, 2012 : 3:02 a.m.
Wow,... wow,... wow,... your freaking me out, dude. What's the hang up anyway? Thu, Mar 29, 2012 : 10:08 p.m.
Thu, Mar 29, 2012 : 8:48 p.m.
...said the curmudgeon, who had trouble seeing beyond his own sense of how the world should be.